Verizon’s seen the writing on the wireless industry wall. Those outrageous fees they charge? That can’t continue with T-Mobile now covering 97% of the population that Verizon covers. The Un-carrier has them quaking in their gold-plated boots. The Verizon solution? They don’t just want to deliver content, they want to OWN the content they deliver. But creating great content is hard! Netflix, Amazon, Hulu (all available via Binge On by the way)… they know how to do it. Verizon doesn’t. But that doesn’t stop Verizon from trying. They’ve spent literally billions trying to buy companies to create a content business. So far, the results have been… lacking. Now rumors suggest Verizon’s going after Yahoo. 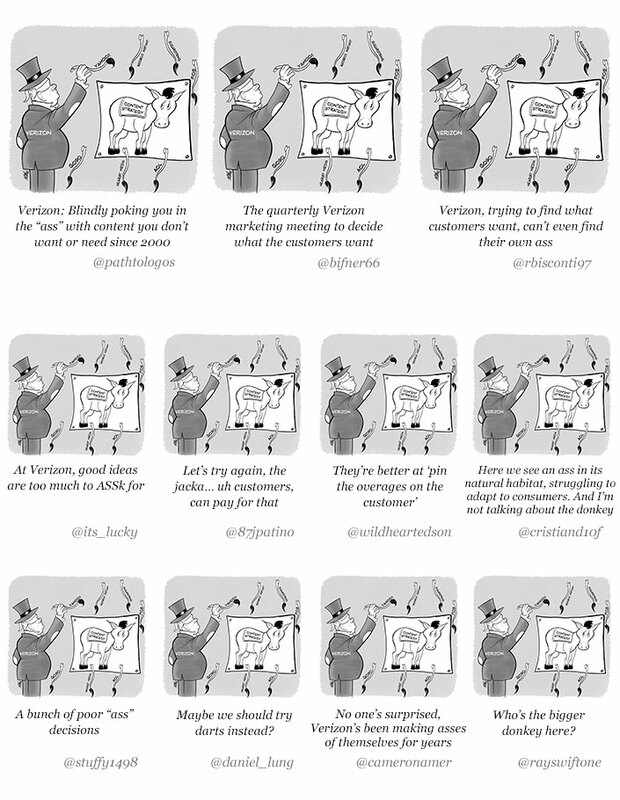 We challenged the Twittersphere to come up with captions to a cartoon depicting Verizon’s content strategy. Verizon Caption Contest. Link to view and download the asset in the Media Library.